A child is diagnosed with cancer every three-and-a-half minutes and only a staggering 4 percent of U.S. federal funding is earmarked for childhood cancer research. 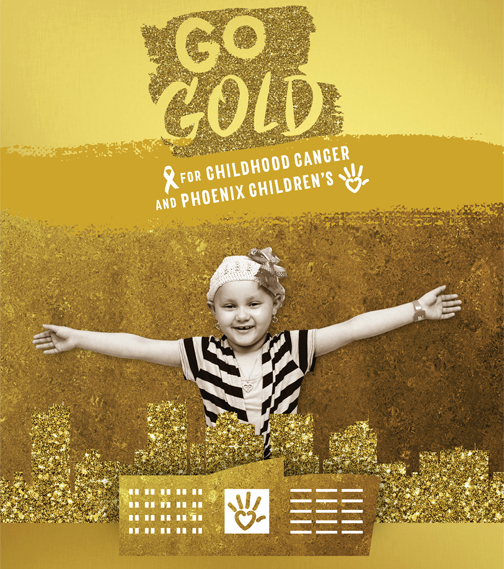 That is why Phoenix Children’s Hospital Foundation is asking the Community to Go Gold this September during Pediatric Cancer Awareness Month – with the goal of raising $1 million to support the Hospital’s Center for Cancer and Blood Disorders. In a show of solidarity, Phoenix Mayor Greg Stanton, Peoria Mayor Cathy Carlat, Tempe Mayor Mark Mitchell and Scottsdale Mayor Jim Lane will each participate in a formal ribbon cutting ceremony on Thursday, September 1, to help kickoff the initiative. Each ribbon cutting will include members from PCH as well as a family impacted by pediatric cancer. Local businesses and the community at large are invited to join the movement. Those already committed include: Arizona Diamondbacks, Coulter on Camelback, Ideas Collide, Law Offices of Mark Kirkorsky, Lister Assister, Cheeky Chick Baby Boutique, AZ Pro Group, Cobblestone Auto Spa, Cowboy Saloon, Jack Morton Foundation, Java Boba, Le Macaron, MMPR Marketing, Nike at Scottsdale Quarter, Slim Chicken, Arizona Central Credit Union, Landings Credit Union, Sprint, McDonough Corporation, The Ross Team- Nova Home Loans, Harkins Theatres, Marriott, Larry H. Miller Dealers, Camelback Volkswagen Subaru Mazda and Direct Energy. Churn: Portion of proceeds from gold themed treat will go to Go Gold. Papa John’s: Go to papajohns.com and enter code PCH at checkout for 40% off your order. Ten-percent of proceeds will go to Go Gold. Sauce Pizza & Wine: September 12 – 18, Sauce is donating 100% of proceeds from kids menu items to Go Gold. Spinatos Pizzeria: $1 from every dessert sold to go to Go Gold. State Forty Eight: Producer of the official Go Gold t-shirt where $5 from every shirt will go to Go Gold. Zoyo Neighborhood Yogurt: Will launch a flavor of the month and do a give-back night in September that will go to Go Gold. Dunkin Donuts: Will sell a Go Gold donut with 50 cents from each donut sold going to PCH. California Pizza Kitchen: Desert Ridge and Tempe Marketplace locations will offer a 20% donation of your total bill when “Go Gold for PCH” is mentioned any Wednesday in September. Kabuki Japanese Restaurant – (Tempe Marketplace and Westgate Entertainment District) Special Dish for the month of September: Curry Shrimp on Crispy Rice. $1 from the sale of each dish will be donated back to PCH for Go Gold. 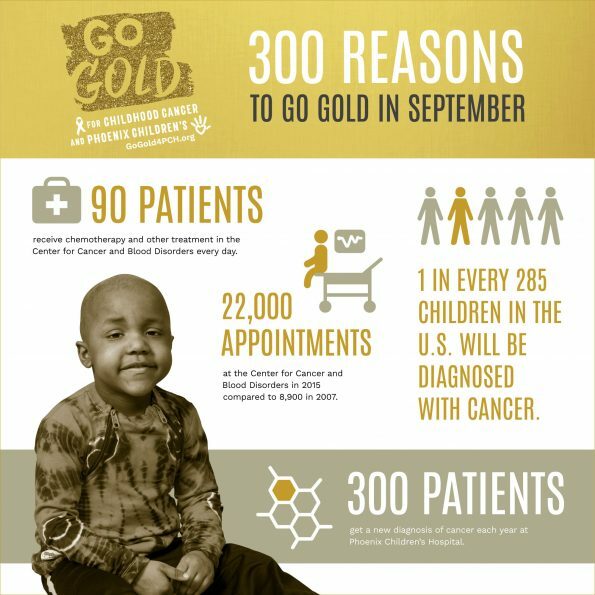 For more information about Go Gold visit GoGold4PCH.org or click on the hashtags you see, #GoGold4PCH. Phoenix Children’s Hospital, Arizona’s only hospital honored by U.S. News & World Report’s Best Children’s Hospitals, provides world-class inpatient, outpatient, trauma, emergency and urgent care to children and families in Arizona and throughout the Southwest. As one of the largest children’s hospitals in the country, Phoenix Children’s provides care across more than 75 pediatric specialties. The Hospital is poised for continued growth in quality patient care, research and medical education. For more information about the Hospital, visit www.phoenixchildrens.org.